I will be the first to say that it’s easy to get carried away with all the great ways to promote your events and/or your events business on the Internet. Tactics like marketing via search engines, email, social media and blogging have become so popular that we often forget that there are proven offline marketing tactics for events just waiting to be used. And before you roll your eyes and say “thanks but no thanks”, think about these stats for a minute. Although most online event marketing tactics still provide a great return-on-investment (just look at the stats here), the results above show that, as more and more people market their wares and their events online, there is more and more competition for people’s eyeballs and there is more online noise that potentially drowns out your message. 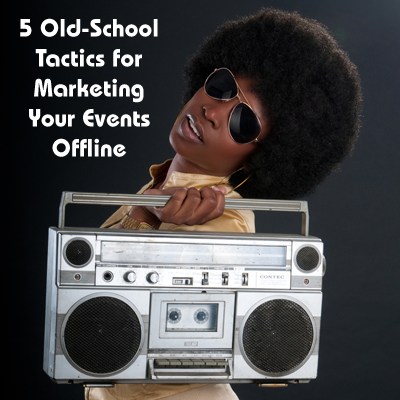 So if you find yourself looking for other ways to supplement your Internet marketing efforts – or if you want to explore other ways to reach an audience that may not be looking for you online – here are five time-tested, old school offline event marketing tactics that are worth trying. Before there was Twitter, Facebook, LinkedIn and Google+ to spread the word, there was, well, PEOPLE ACTUALLY TALKING TO EACH OTHER. But how, you ask, can this be? And what magical fairy dust did you sprinkle on people to get them to actually talk to each other either face-to-face or on the phone about your event? Well, let me get past being overly sarcastic and say that this is where coming up with great reasons to attend your event works wonders. For example, people are more likely to spread the word about your event when you have booked an amazing speaker or entertainer. Or when you are offering an exotic and interesting menu (foodie culture is thriving right now). Or when they were so enamored by last year’s event that they tell everyone they know that they would be a fool to miss this year’s event. Basically, you will get great word-of-mouth both offline and online if your value propositions and event drivers are worthy enough to stir up interest. However, you can also reach out to influencers in your industry – those people who are well-connected and have the ability to influence many others – and see if they will talk up your event to anyone and everyone they interact with. You may need to entice them with free attendance or some spiffs, but it’s always worth reaching out to them and asking them to spread the word for your event, especially if your event theme or focus is in their wheelhouse. This tactic started to fall out of favor about 15 years ago when email marketing campaigns became so easy to implement and so inexpensive. And by inexpensive, I mean about 100 times less expensive than direct mail. But cost isn’t everything. An oversized postcard may cost $0.30-$0.50 per recipient, but when you consider that response rates for sending direct mail to an existing customer average around 3.4% compared to 0.12% for email, then you start to see the value of direct mail. In addition, because so many people have jumped on the Internet and email marketing bandwagon over the last 10 years, the volume of direct mail that your potential attendees receive has dropped dramatically, making your missives much more visible in their literal, tangible inboxes. It’s this tangibility of direct mail that makes it so valuable for appealing to attendees for everything from conferences to weddings, and it’s why many marketers still use it to market events (often in combination with email because you reinforce your message on multiple fronts). Another great thing about direct mail as a valuable offline event marketing tactic is that it’s also easier to implement than ever before. Local print shops and mailing houses will bend over backwards to land new customers, and online printing companies like VistaPrint and PrintPlace provide good discounts and fast service on postcard printing and direct mailing. Often the best place to promote your upcoming event is at another event with an audience similar to your event. First, the people in attendance have proven that they enjoy devoting their time to attending events. Second, they probably are on the lookout for other similar events, so this is a great time to plant that seed in their head about your event. So how do you reach out to these people? For starters, contact the event organizers and see if they are open to any type of cross promotion between events. See if they are open to mentioning your event from the stage and allow you to either say a few words or set up a table or booth to promote your event. And even if this costs you some money for booth space or advertising, you can hopefully more than recoup your costs by registering as many attendees as possible on premise at the event. Another thing to ask is if you can distribute flyers or inserts to the event’s attendees or include them in the show “bag of goodies.” Again, this may cost you a little in printing and design costs, but it puts you in front of a receptive audience who may be very interested in your leave-behind. Marketing through professional associates and organizations is usually a game of negotiation. Often they have an audience of members who are very receptive to the communications and recommendations they receive from the organization. And very often they also have a need for money to fund their own events and membership offerings. This type of marketing works best when the focus of your event and the goals of the organization align. For example, if your event is a fundraiser for a local animal shelter, your local veterinary association may be a great partner to seek out for cross promotions (vets with sizeable disposable incomes can make wonderful donors). Usually, once you have found common ground with the organization, the horsetrading begins, so you should decide what you are willing to offer. It could be more cross-promotion agreements. Or a donation to their general fund. Or discounts for their members. But whatever you decide to give away, what you must get in return at minimum is inclusion of your event details in at least a few of their member communications (and the more mentions the better, because marketing is vastly more effective when people see your message repeatedly). One thing to remember about partnering with associations or organizations for your offline event marketing efforts is that both parties need to see value in the relationship. You may need to go back to this partner again if you have a recurring event or similar events, so you want them to get as much out of the relationship as you do. Many people in the events industry are naturally fluid public speakers and wouldn’t think twice about taking the stage to promote their upcoming event. In addition, you or your colleagues may be asked on occasion to speak on a topic that is familiar to you. On these occasions, you may want to ask the event promoters if you can also promote your upcoming event at some point during your speech or presentation. At times the occasion may not be appropriate for such promotion. Say, for example, you are managing a bridal show; it probably wouldn’t be appropriate to promote your show if you are MCing a wedding that you have planned. However, if you are asked to speak at a local club or industry event about the latest wedding trends, you may want to ask if you can also mention your bridal show and make that part of the negotiation for appearing. The great thing about speaking engagements is that you are instantly seen as a person of authority and a subject-matter expert, and so the things you mention at the podium are given more consideration than if they were uttered by a random stranger. So try out these 5 offline marketing tactics for events when you are looking for fresh event marketing alternatives, and let us know if you have any good suggestions of your own in the comments below.